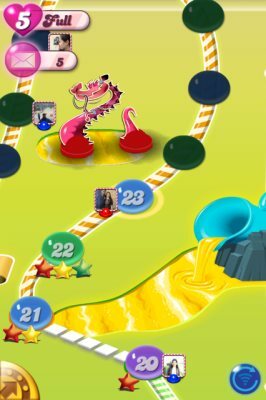 Candy Crush Saga for iPhone, I have heard so much about this game that I decided to give it a try as well. I wanted to know why all my colleagues are so addicted with this game that I always find them playing this game like during breaks, lunchtime, in the elevator, even in boring office meetings (sorry didn’t mean to write this guys, but hey I didn’t mention any names so they’ll never know). So I downloaded this game on my iPhone and started playing. Within minutes of playing it I was addicted to it. I found myself wanting to score more and clear one level after another. Its the easiest to play game, so you can just relax and have fun playing it. The added advantage is that you can link your Facebook account with this game app. Once you do that, it starts showing you which levels your friends have cleared with what score. This makes it more interesting as you want to surpass your friends who have cleared more levels. You can also post your progress on your Facebook wall. Once after downloading the app, when you launch it you will see Tiffi and Mr.Toffee, the animated characters who will guide you through each level. You will be given a target number of points to be scored and the number of moves that you are allowed to complete that goal. 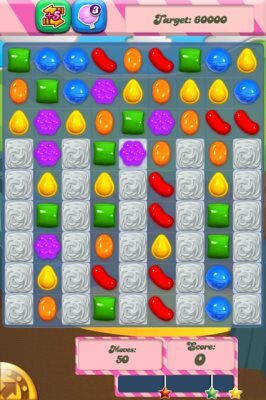 Your screen will be full of different shaped candy, where you will have to move them in a way that you get minimum three in a row, either horizontally or vertically. Each level offers you extra boosts to help you out. You can only move ahead to a new level when you clear the current one. Keep in mind that you have 5 lives, if you use them all then you will have to wait half an hour for getting another life. You can ask your friends to gift you extra lives if you run out of them. That ways you will not have to wait half hour to continue playing this game. Move and Match candy’s to eliminate them from the board. You get five lives to clear a level. Limited number of moves in each level. Lives can be gifted to or from your friends. All in all it is a fun addictive game, which keeps you wanting more. I just didn’t feel like keeping my phone down once I started playing. As so many people are already playing this game, its needless to say that its popular and worth trying out. 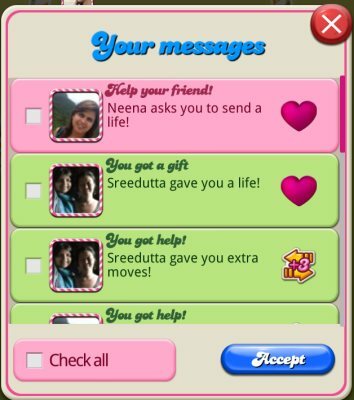 Go ahead and check Candy Crush Saga out for iPhone from this link.